A gripping portrait of one family’s gamble that rodeo and ranching are the future of the West—and not just its past. For generations, the Wrights of southern Utah have raised cattle and world-champion saddle-bronc riders—some call them the most successful rodeo family in history. Now Bill and Evelyn Wright, parents to 13 children and grandparents to many more, find themselves struggling to hang on to the majestic landscape where they’ve been running cattle for 150 years as the West is transformed by urbanization, battered by drought, and rearranged by public-land disputes. Could rodeo, of all things, be the answer? In a powerful follow-up to his prize-winning, best-selling first book, New York Times reporter John Branch delivers an epic and intimate family story deep in the American grain. Written with great lyricism and filled with vivid scenes of ranch life and the high drama of saddle-bronc competition, The Last Cowboys chronicles three years in the life of the Wrights, each culminating in rodeo’s National Finals in Las Vegas. Will Bill and Evelyn be able to hold the family together as rodeo injuries pile up and one of their sons goes off on a religious mission? Will their son Cody, a two-time world champion, make it to the finals one last time—and compete with his own son? And will the younger generation—Rusty, Ryder, Stetson, and the rest—be able to continue the family’s ways in the future? This is a grand and compelling work of reporting that, like Buzz Bissinger’s Friday Night Lights, offers deep insight into American ritual and tradition. And in telling the Wright family’s story, from branding days to rodeo nights to annual Christmas gatherings, Branch captures something vital of the grit, determination, and integrity that fuel the American Dream. 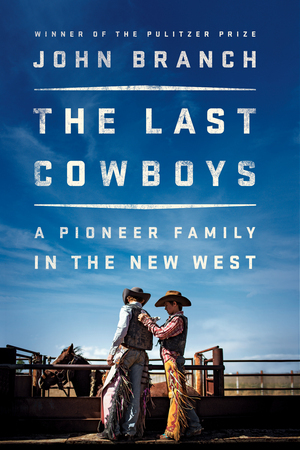 An unforgettable book by one of the finest reporters of our time, The Last Cowboys is a moving tribute to an American way of life.